A couple of days ago, I mentioned that I had a fourth story accepted for publication, but since the publisher hadn’t made a formal announcement yet, I couldn’t give out particulars. 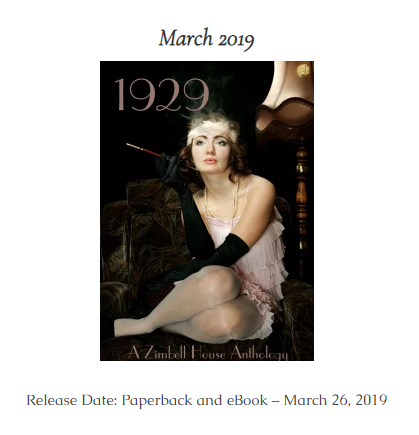 However, this morning Zimbell House Publishing on their Coming Soon page (scroll down) posted notice that “1929: A Zimbell House Anthology” will be published in both Paperback and eBook formats on March 26, 2019. My short story “The Devil’s Regret” will be included in the anthology. Some of you may have read a few variations on that tale I had been playing with here on my blog in months past. My study group from the writing class I took last November, had plenty of opportunities to read refined versions of the strange adventures of sixteen-year-old Timothy Quinn, the boy who could hear news stories from the future on the radio, and discovered he was the only person standing between an innocent ten-year-old girl and murder. So far, only a single promotional image has been published on their site, but I’ll post more information as it becomes available. 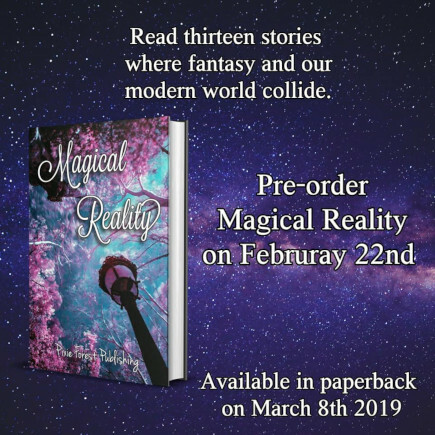 On top of that, as you already know, my short story “The Dragon’s Family” is being published in Pixie Forest Publishing‘s anthology Magical Reality. We now have firm dates that the book can be pre-ordered on February 22nd, and will be available in paperback on March 8, 2019. This is a nice way to end the week. Wow! That was a heck of a typo. Fixed. Thanks. I seem to remember this story and it was very good. Congratulations. Thanks, and thanks for the shout out on twitter. The version I submitted for publication included a number of elements from other stories, but is itself unique.